Benelli was founded in 1921, and quickly acquired a strong reputation from numerous racing successes. Their engineering excellence led to several high-revving lightweight four-stroke motorcycles, DOHC- and even supercharged race bikes. During WWII the Benelli factory (producing aircraft parts) was targeted by bombers. This led to a delayed launch of their first post-war motorbike: in 1952 a unit-construction, swinging arm 250cc twin. After many other compact sports bikes and mopeds, Benelli saw the need to launch their first big bike, partly to further finance their racing department. 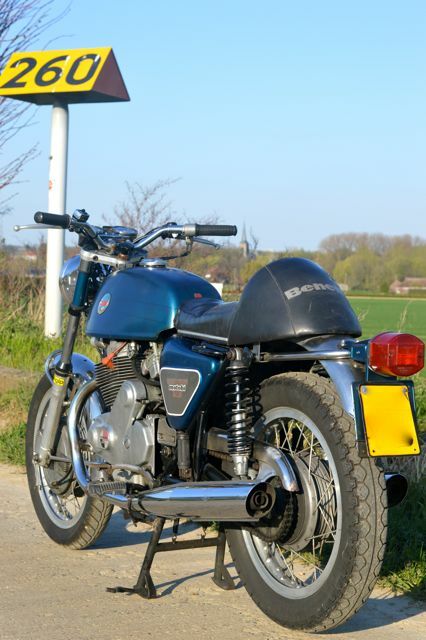 Following the huge success of 650 twins (mostly British, but also the Yamaha XS650 was immensely popular), Benelli launched their Tornado 650 in the end of the 60’ies. The iconic British parallel twin inspired the Tornado, but parallels between them are hard to find. The horizontal split engine cases, 4 bearing crankshaft and over-square dimensions certainly gave the Tornado a lot of persuasion power, despite of the higher price. 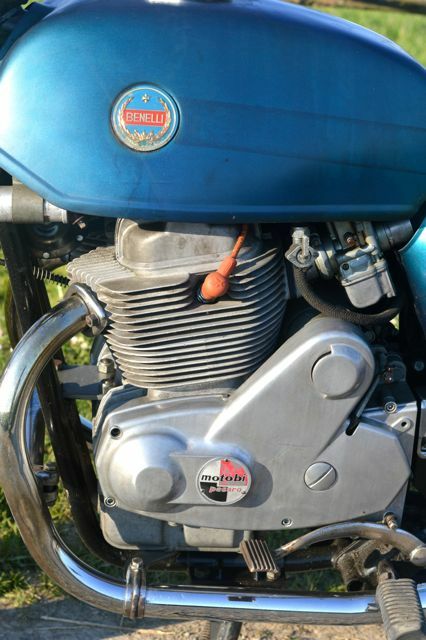 Piero Prampolini (later the designer of the legendary Benelli Sei) was responsible for the racy 58mm stroke and 85mm bore dimensions, which made the Tornado rev like a two stroke, but still with adequate torque in the low rev range. 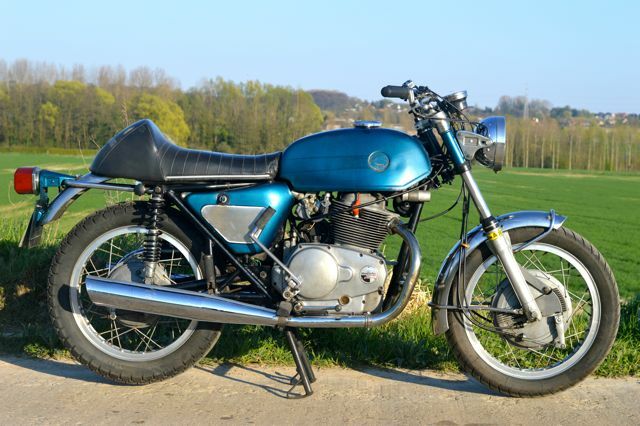 This 1971 all-original Italian sports bike is a second series of the Tornado Motobi 650. The paintwork and chrome are still untouched and original, and in a well-preserved state, the paintwork being a bit matt. The engine starts up first kick and produces a hair-raising roar, which has indeed a lot of similarities with a screaming two stoke. But once on the road, the smoothness of the engine is much appreciated. The well-balanced engine and lack of excess flywheel mass make sure the bike is gunned forward without any hesitation; even in the low rev range. On the road, a steady and reactive frame (due to the front Marzocchi forks and rear new Koni shocks), relaxed seating position, powerful well-dosed brakes, super cool engine, topped with a beautiful roaring sound coming from the twin Lafranconi silencers, will make you enjoy every twist at the throttle. And then there are the looks: such a beautiful robust engine, like it’s on steroids, aluminium Borrani rims, clear and accurate CEV clockwork and the sensual Italian design. This Tornado 650 seems to have been sold new in Italy (there still is a sticker on the front mudguard), but is at least 20 years in Belgium. 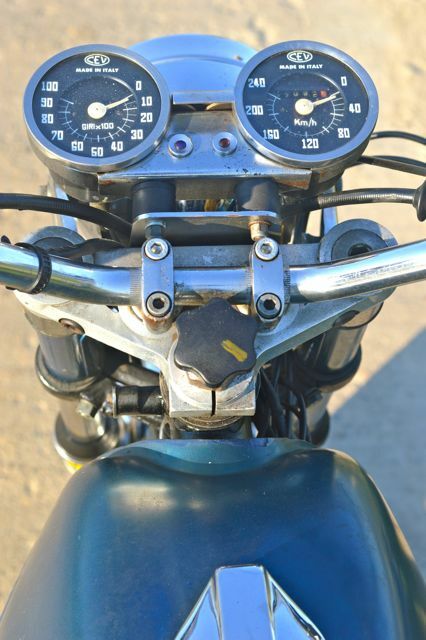 The 27000 km seem to be original as they correspond to the clean condition on the bike. The bike comes with Belgian documents. Apart from the seat (could be a period optional extra?) and the new rear Koni shock absorbers, the bike seems to be totally original. 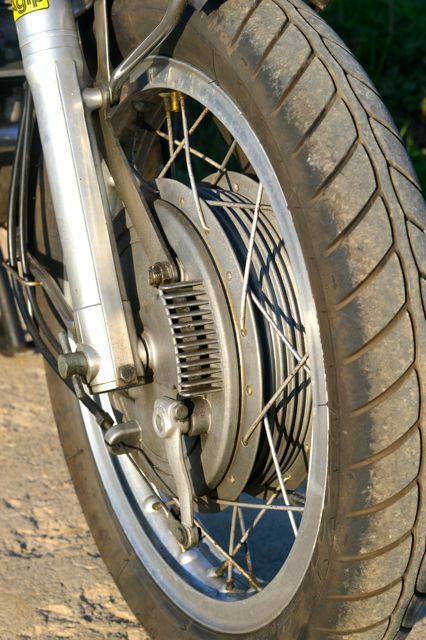 The front tire and chain (modern O-ring) have been renewed recently. Remarks: the front Marzocchi forks work very well but the fork tubes are pitted, so would benefit from hard chroming and the RH side tank badge is missing (as seen on photos). The battery should be replaced. 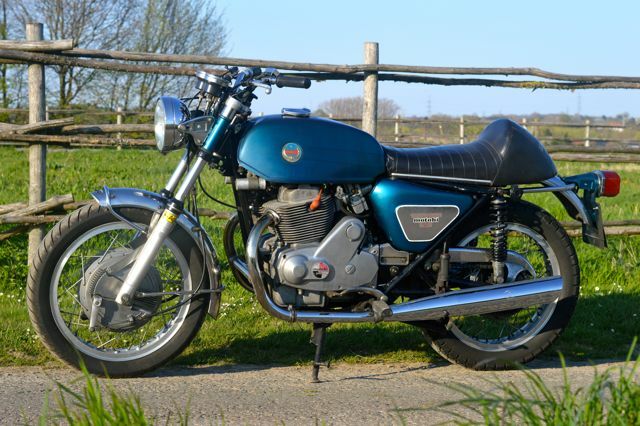 This is a rare opportunity to own a rare Italian parallel twin, in an untouched original condition, in nice running condition.